I am beginning to like working with layers. It is a bit of a cop out in terms of design, since one never knows with certainty what the next tier will add or subtract from another. Certainly working with a computer photo editor allows the artist to create layers that can be superimposed without affecting the layer below (which is what happens with painting). The possibility of ruination is opposed by the possibility of genius. Hopefully, with experience, the artist will minimize the chances of ruining the piece. I began with washes of Prussian blue and quinacridone burnt orange. I love that combination. I smeared on some latex resist and applied carmine red. After removing the resist, I splashed some sepia and red inks, which I spread with a stream of compressed air. Each layer is very distinct from the previous one. 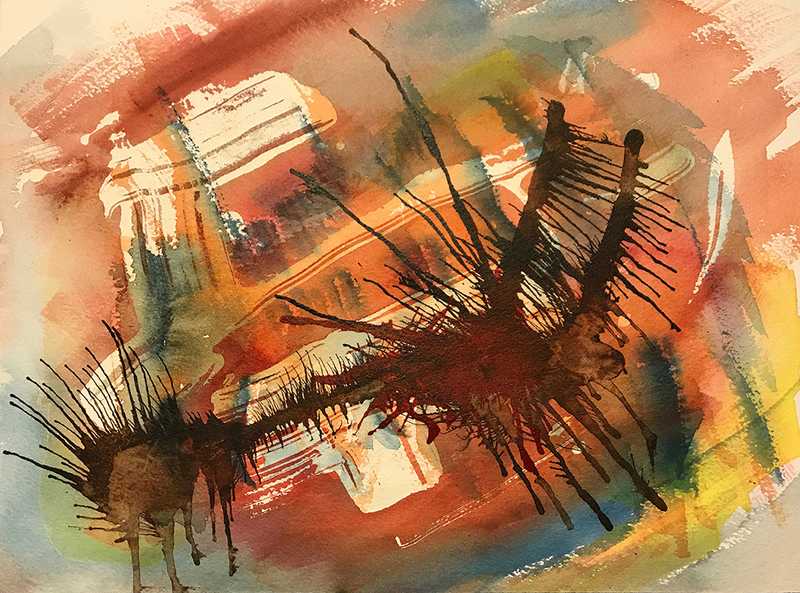 This entry was posted in Personal Stories and tagged abstract art, artistic process, creative process, creativity, ink, latex resist, painting, visual arts, watercolor. Bookmark the permalink. I think this is a great direction (I do a lot of layering myself, so I guess I am prejudiced, but, each person does it his/her own way, I think) and I particularly love the way this one turned out. So much depth and kind of mysterious, I keep peering into it and seeing more. Thanks, Claudia! The trick is for successful interaction among the layers. That’s hard with painting. Yes, it requires some patience, I think, waiting between layers so they don’t mix or get muddy (I have trouble with this step, so I usually work on more than one thing at a time). The clarity of this piece that you did is wonderful. Thanks, Claudia. I try to do more than one thing at a time too. I have a basic idea of what to do next but randomness is also a factor.